HIV Ireland is delighted that President Michael D. Higgins accepted an invitation from our Board to become the first Patron of HIV Ireland. Niall Mulligan, Executive Director of HIV Ireland said ‘ It is a real honour for HIV Ireland to be recognised by President Higgins for our 30 years of work in responding to the challenge of HIV. 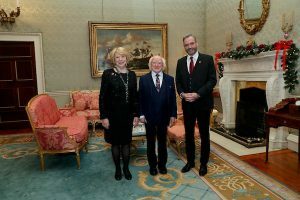 In agreeing to be our Patron, President Higgins shows continuing solidarity with all people living with HIV in Ireland’. Since our beginnings in 1987, HIV Ireland has been to the forefront of responding to the many challenges brought about by HIV. We work within a harm reduction, human rights based ethos always placing the needs of people living with HIV at the centre of our work.